Biking can be a great workout and an environmentally sustainable way to commute to and from work. Unfortunately, thousands of cyclists are seriously injured in collisions involving motor vehicles every single year. 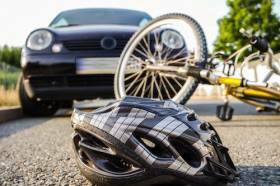 According to statistics compiled by the National Highway Traffic Safety Administration (NHTSA), over 800 bicyclists were fatally injured in motor vehicle collisions throughout 2015, and an additional 45,000 American bicyclists suffered serious non-fatal injuries that year. If you or a loved one have been injured in a bicycle accident, it is time to contact a legal professional and learn about your options for pursuing compensation. The number of bicycle accidents throughout the U.S. increased by 12% in 2015. This rise in bicyclist injuries has prompted a number of states to enact laws that increase bicycle safety. In January of 2019, Illinois became one of two states to adopt the “Dutch reach” law. This law updates road safety manuals to instruct motor vehicle users to exit their car by opening the door with their far-reaching hand. By using the opposite hand to exit the vehicle, passengers and drivers alike are forced to turn their body and face behind them, which will allow them to see any bicyclists near the vehicle and avoid opening their door into the bike’s path. Studies show that the Dutch reach can significantly lower the number of “dooring” accidents in which bicyclists are injured by car doors.